STAR's 5K Run takes place on the scenic grounds and coastline of Sherwood Island State Park in Westport, CT. Race is officially timed. Runners must check in early to receive bibs and numbers. Advance registration strongly recommended. Check in starts at 9 a.m. Conveniently located off I-95 exit 18, this park has some of the most scenic views of Long Island Sound. There won't be any traffic to worry about as you traverse the tar paths, cinder trails and hard-packed beachfront. 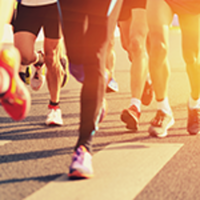 The 5K Run is a relatively new feature to STAR's Annual Walk, Run & Roll. There is also a shorter route suitable for people of all abilities, including wheelchairs, walkers and strollers. (To register family members for the Walk, family activities, refreshments and tee shirts visit www.starct.org). Kids under 5 years are for that walk. Rain or Shine. No Pets. Our events benefit STAR, Inc., Lighting the Way , a non profit organization that has been a leading provider of support and services to people with intellectual and developmental disabilities in Fairfield County, Connecticut since 1952. Your registration includes a continental breakfast, lunch, kids' fun bus, face-painting, balloon sculpting, crafts, music, dancing and more....all on Sherwood Island's seaside park grounds and included in your entry fee! Sign up by April 24 to guarantee your size for our commemorative t-shirt. Entries after that date will have shirts sized as available. We could run out so please register in time! There are NO AWARDS given to the one mile distance & kids fun run. Our family friendly registration fee is only $30 for ages 19 & over, and just $15 for 18 & under. THERE IS NO ONLINE FEE. Race day registration increases by $5 for ages 19 & over- 18 & under stays at $15. STAR Inc relies on the generosity of participants and sponsors and appreciates any donation above and beyond the sign up fee. We also offer a ‘VIRTUAL’ Run or Walk’ for those supporters who can’t be with us that day. You will receive an event shirt and Run/Walk commemorative bib in the mail.